I’ve attended and given many seminars on how to play pinball so I can say from experience this is one of the best. 2011 World Champion Andrei Massenkoff and multi-World Champion Bowen Kerins do an excellent job covering both the basics and lots of advanced technique. To deliver all this flippery goodness they use Paragon, which is an older solid-state game, and Full Throttle, which is a brand new game from boutique manufacturer Heighway Pinball of England. 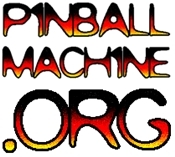 Thanks to Pinball News for the video.